Clam chowder, minestrone, gazpacho, avgolemono, chicken noodle… who doesn’t like a nice steaming bowl of delicious soup? (Well, my friend Kristal doesn’t, but she’s got some weird thing about not liking hot liquids like soup, coffee, etc.) Being wintertime, it’s the perfect meal to chase away all that cold, even though for me it’s a year-round thing. But my favorite thing about soup has to be its elasticity and ease. From the simplest consommé to a big & hearty stew, you toss together just the right combination of liquids, chopped stuff, and spices, and voila! Dinner – or lunch – is served. Granted, there are some recipes that require a bit more effort and patience, but overall you’re not going to be slaving away for hours. And if you’re like me and don’t really have a lot of time, here are a few ways I get around to having delicious soup with minimal effort and maximum taste, without breaking the bank. ~ Noodle soups: Everyone remembers living on ramen at one point or another, and there’s no shame in continuing to indulge in the long noodles swimming in salty broth. But ramen can get boring, so by all means, jazz it up! I’m sure most folks have done this and I would love to hear your ideas, as I’m sure I haven’t explored the entire spectrum of ramen possibilities. Sometimes I add mixed veggies and chopped chicken or diced tofu; other times I go very old school and throw in a whole egg and let it poach in the broth, adding chopped tomato at the end; and when I’m really feeling exotic, I make my famous Curry Shrimp Ramen Soup (recipe coming soon!). I have a lot of other ideas, but this should give you a general idea of what you can do with the old college kid staple. For those of you Trader Joe’s fans, head to the soup section and invest in their $0.99 Rice Noodle Soups (available in Garlic, Spring Onion, and Mushroom flavors). They are AWESOME, affordable, and contain all-natural ingredients in the flavor packets. Absolutely preservatives, MSG, or junk like that. Goes to show that you can make great “instant” food without loading up on the chemicals. I sense several new soup combos in my future with these! ~ Use a good base: Got some chicken or veggie broth handy? Maybe a simple cream of tomato soup or some vegetable or squash bisque? Some frozen or canned vegetables, or perhaps some beans? Throw some of these together with some good spices, simmer, and you’re done. If you have a bit more time on your hands and like creamy v. brothy soups, take about 2/3 of what you’ve cooked, puree w/a hand blender, and add the remaining ingredients to get a nice hearty soup. As long as you have a good starting base and not just plain old water, you’re almost halfway there. ~ Combine leftovers w/the aforementioned good bases for a satisfying lunch: When I'm pressed for time, I'm a big fan of the boxed soups that Trader Joe’s carries. They’re all very basic and delicious on their own, in flavors like Sweet Potato Bisque, Creamy Tomato and Roasted Red Pepper, Butternut Squash, Creamy Corn & Roasted Pepper, this apple one whose proper name escapes me right now… they have a great variety. But I see them as the beginning of a great meal and the end of stashed leftovers. Today, for example, I had a little bit of my mom’s Arroz con Pavo still lurking in the fridge here at work and added it to the Creamy Tomato and Roasted Red Pepper, and it was such a yummy and filling lunch! 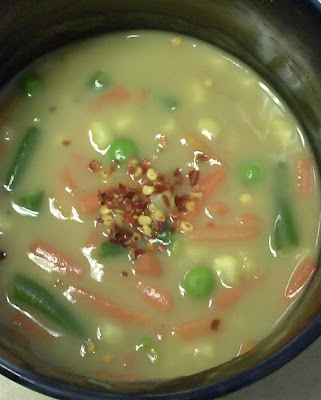 Another extremely simple combo is to add frozen veggies to the Vegetable Bisque, nuke, and add some crushed red pepper flakes and you’re on your way to a very fast and easy work lunch. They run between $2.29 to $2.49 for 16 oz. I know I’ve seen similar boxed soups at major chain grocery stores for a bit more, but if you can’t afford those, even a regular old can of cream of tomato soup can become a monumental affair. There are endless possibilities in the land of soup and for those of us on a tight budget, this is wonderful news because that means there’s always something delicious and filling on the horizon. You know how much I preach about creativity in the kitchen (or the office break room), and I will continue to harp about it now: think outside the box, and you’ll never feel like you’re missing out, just because money’s tight. I am making one of the many versions of chicken soup that I make today - so I agree - never under estimate the power of soup! Hello Kimberly, Stephanie Molina here. (Patrick's wife.) Our son, Maxwell, loves the Tomato with Roasted Red Pepper from T.J.'s. Actually, he and I love soup in general. I am enjoying your blog - you HAVE to be frugal feeding three children! Glad you're enjoying it, Stephanie! You've given me a good idea, too: I'll see about posting some good kid-friendly recipes for all you hard-working moms out there. Tell Patrick I said hi & to email me sometime! Thanks for the great ideas! I do love Avgolemono and pea soup, but I think I'll try experimenting with something new. 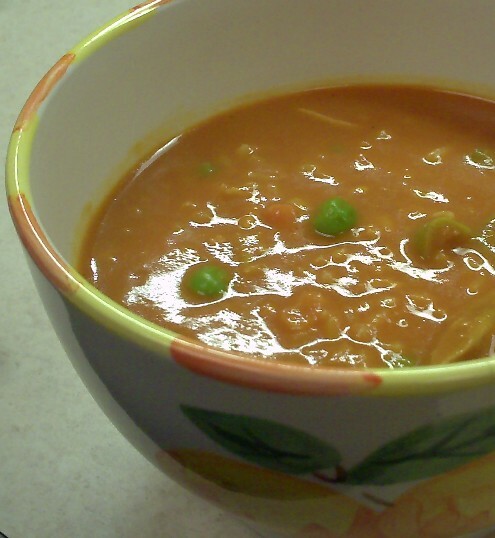 Somehow I missed this blog, I love soup! Soup was invented for leftovers! Some chicken, beef, or veggies that's not quite enough for serving as an entree again--no problem, they are the start of a great soup. Soup's also a great way to salvage a not so great tough steak or roast. Just get out the old crock pot or faster yet, the pressure cooker and presto, a tender new dish.